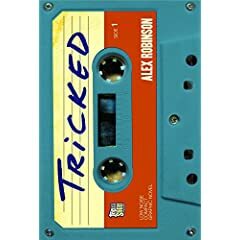 Weaving the lives of six disparate characters into a successful storyline is a difficult feat, but Alex Robinson manages the feat with ease in his graphic novel, Tricked. Robinson creates three dimensional characters in the two dimension panels of this book. As they hurtle towards the book's conclusion, the reader is drawn into their lives and alternate universe. This book is easily the second best graphic novel I have read this year, behind only David B. 's astoundingly good Epileptic. My next book is McSweeney's Quarterly Concern Volume 16, because even though I have read several McSweeney's books this year, I am always in the frame of mind to read one more. Look for a review tomorrow as I finish the book tonight while tending the grill (we're having grilled chicken and a Seinfeldian "big salad," stop by for a plate if you're in the neighborhood).